There is a verse that I remember first reading years ago that kind of stopped me in my tracks at the time and still pops into my mind regularly as a check for my actions. It's a very simple verse, but trying to live by it is not always easy. 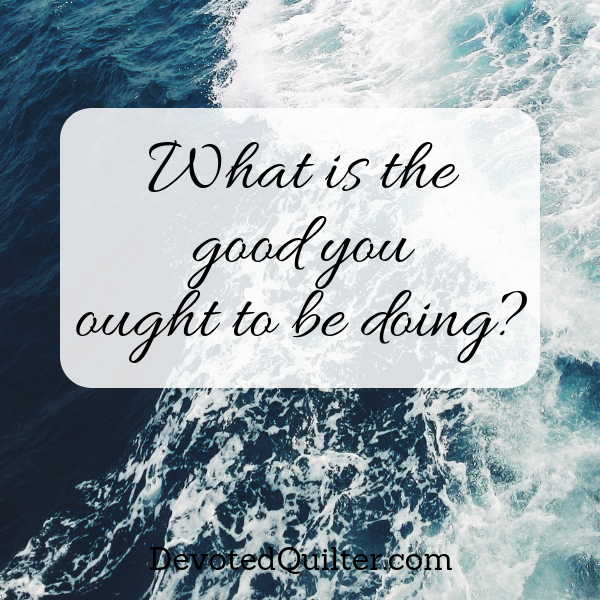 "If anyone, then, knows the good they ought to do and doesn’t do it, it is sin for them" (James 4:17). Doesn't that make you stop and think? I find it interesting that the verse makes no mention of the sinful things we shouldn't be doing, but instead James flips it around and says that not doing the good things we know we should be doing is also sinful. I don't know about you, but there are plenty of times I feel like I should be saying something encouraging or helping someone in someway and I hesitate. Maybe because I don't quite know what to say or because it would be inconvenient or I feel like I don't have the time for it. Whatever the excuse might be, this verse tells me that my not doing that thing I felt I should do was a sin. Lately the verse has been rattling around in my brain a lot because I've been considering how much plastic we use in our house and how to get away from it. It's a bit overwhelming! Plastic is everywhere and for most of the products, especially packaging, I can't seem to see my way out of using it. Sometimes I'm not thinking and I pull out the plastic wrap for leftovers and then this verse pops into my head and I feel like it would be a sin for me to cover that food with plastic wrap when I could look for a reusable container instead. Now, please don't think that I'm saying using plastic wrap (or plastics in general) is sinful! I'm just saying that because I've been reading about the effect of plastic on our environment I feel that the good I ought to be doing is finding other alternatives for my own use. That's the second interesting thing about this verse. It's specific to each person and what they feel is the good they ought to be doing. There's a lady in our church who does a lot of work for the pro-life movement. I think this verse means it would be sinful for her to stop doing that because she believes it is the good thing she ought to be doing. I, on the other hand, don't feel called to fight that fight, so it is not sinful for me to be less engaged with it. There are so many ways to do good in this world that it would be impossible for any one person to do all of them, but just think how much better the world would be if we all did the good things that we feel we should be doing. That's not a verse that I'm really familiar with, but I'm going to look it up and underline it now... We often talk about our sins of "commission" and our sins of "omission", but those terms can be kind of vague - James 4:17 makes it very personal and specific! I can think of a few areas in my life that I can apply this to.